How can VeryConnect's membership software help you? We provide all-in-one membership software solutions. We make managing your membership simpler, aiming to save you 80% administration time. 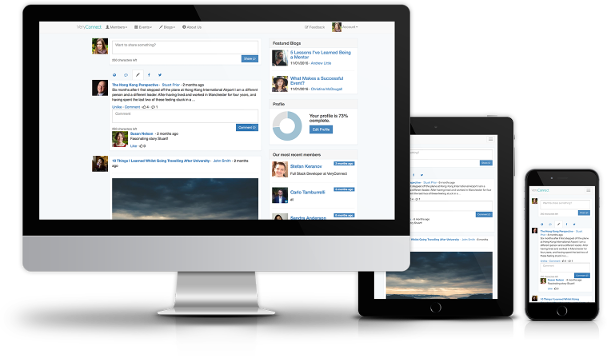 Our community software increases member engagement and adds value to your offering. Our GDPR compliant Membership, CRM and Community software provides automated workflows for renewals, invoicing, emailing and more. Our community provides discussion boards, file sharing and events management. Our helpful team is based in the UK and Europe. We guide you through the software implementation and we're on hand for strategic support once you're live. What Makes our Membership Software Outstanding? Secure and reliable technology in line with the highest standards of engineering. Modern layout with intuitive navigation for your team and members. An all-in-one solution with your selected admin and member features. We're regularly updating our software bringing ongoing benefits. Our customers say that we're great to work with. We help you during the implementation process and with ongoing strategic support.